Homemade watermelon slushies are a great way to cool down on a hot summer day, enjoy fresh watermelon, and at the same time, avoid the chemical and sugar laden store bought variety! 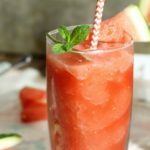 Freezing leftover watermelon is probably the easiest way to keep a watermelon for long periods once its cut open, and a watermelon slushie is a quick yet healthy way to enjoy a sweet summer drink. Kids love slushies too! Whether it’s their brain freezing abilities, the surge of sugary fruit flavor, or the bright colors, these sweet icy drinks are a great way to cool off, and always a hit during the hot summer months. Unfortunately, store bought slushies often contain little fruit and are mostly made up of sugar and chemical flavorings. The best alternative? Homemade slushies! Do I Have To Use Frozen Watermelon? No. 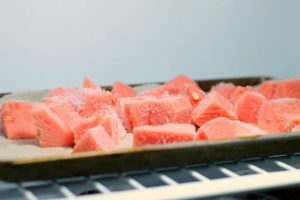 You don’t really have to use frozen watermelon, and honestly fresh watermelon will probably be easier to blend up for most lower end kitchen blenders. This is good news if you have a fresh watermelon you’re about to cut into. On the other hand, using frozen watermelon creates a creamier slushie, and also provides a use for frozen watermelon. I used a Nutri Ninja Bullet blender to make my watermelon slushie, and my only complaint is that it only makes two drinks at a time! Freezing watermelon is a great way to keep a cut melon from going bad, if you can’t eat it all in one sitting, or simply have to much of it! Since frozen watermelon doesn’t really thaw out well, (it goes mushy and gross as the water melts out), it’s best to use frozen watermelon in smoothies and drinks such as this one. Freezing watermelon is super easy and only takes a few steps. Cut the melon in half with a large chefs knife, and then again into quarters. Remove the red flesh from the rind by running the knife along the white pith. Dice up the ripe watermelon, and spread it out on a parchment lined tray. Place the diced watermelon in the freezer to freeze, about 20 minutes. You can easily enjoy healthy fruit slushies all summer long. The trick is to make them yourself of course! 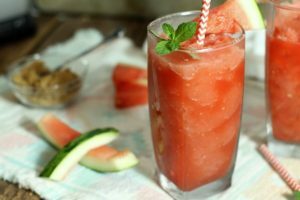 Luckily almost all slushies, including this watermelon slushie, are easily made in under five minutes with only two or three ingredients. 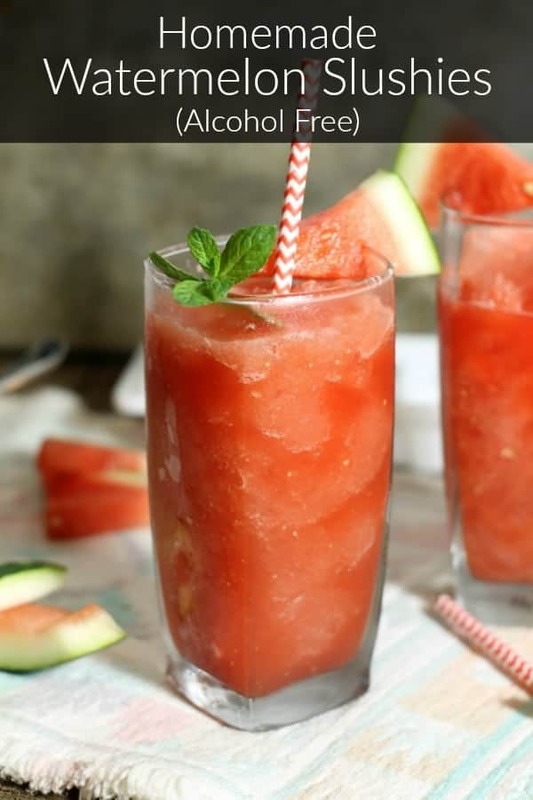 The type of fruit used is really up to you, but watermelon is perfect for slushies since frozen watermelon doesn’t thaw well, and it is naturally sweet. This means less added sugar, if any! Mix all the ingredients together in a blender and presto! You made a slushie! Serve immediately or drink it yourself! The sugar and lemon are of course optional in the recipe above, but the lemon adds just a little bit of tartness that makes the slushie really pop with flavor. If the watermelon you have is naturally very sweet, you can consider leaving out the sugar, but its summer, a little bit of sweetness never hurt anybody! If you are having trouble blending the slushie, and it seems to thick or icy, add some water to thin it out and let the blender do it’s job. There should be no large chunks and the blender should be able to smoothly blend all of the watermelon and ice chunks. Serve these slushies on a hot summer day, at a BBQ or when you(or your kids), are craving something sweet. Cool down this summer with an icy watermelon slushie. Made in less then five minutes with only four ingredients! Mix all the ingredients together in a blender and presto! You made a slushie! If the slushie is very thick, and icy, and the blender is having a hard time blending, add a splash of water to help it out. The blender should be able to blend all of the slushie with no large chunks remaining. I have been seeing so many watermelon drinks lately! They all look so good! I can’t wait to try this! They do don’t they! I love eating as much watermelon as I can when it’s on sale! This is the perfect, refreshing summer drink! What a refreshing way to have watermelon. And such a great use of frozen. This looks so refreshing! I wish I could be sitting outside in my garden with this in my hand right now. Definitely something I have to try this summer! Now that the weather is warming up here in PEI that’s exactly what I have planned! This looks so good! What a great idea! I didn’t think about freezing leftover watermelon! I will have to try that! I always wasted so much watermelon because I could never eat a whole one by myself, freezing it and making plushies and smoothies solved that! I love this refreshing and delicious summer drink! So perfect that it’s alcohol free too so everyone can enjoy. Cheers! I’m all about slushies!! Especially when they are totally fresh and delicious and don’t involve a ton of added sugar. Oh, and extra especially when they are a gorgeous color like this!! I know! I was surprised at how red the watermelon stayed after freezing! I was expecting a paler color..but it held! And no food coloring!